Ask any Amazon seller (or Etsy seller, or eBay seller, or Shopify store owner…) what the top 10 things are that they struggle with weekly. I can promise you that finding what to sell on Amazon (or other sites) is sure to be near the top. Making confident sourcing decisions can catapult your sales over the moon or drive you to bankruptcy. Because the very nature of marketplace selling means constantly scouting for the best things to sell online, having a dependable and reliable way to discover what’s hot, and what’s not is crucial. Here’s the thing. 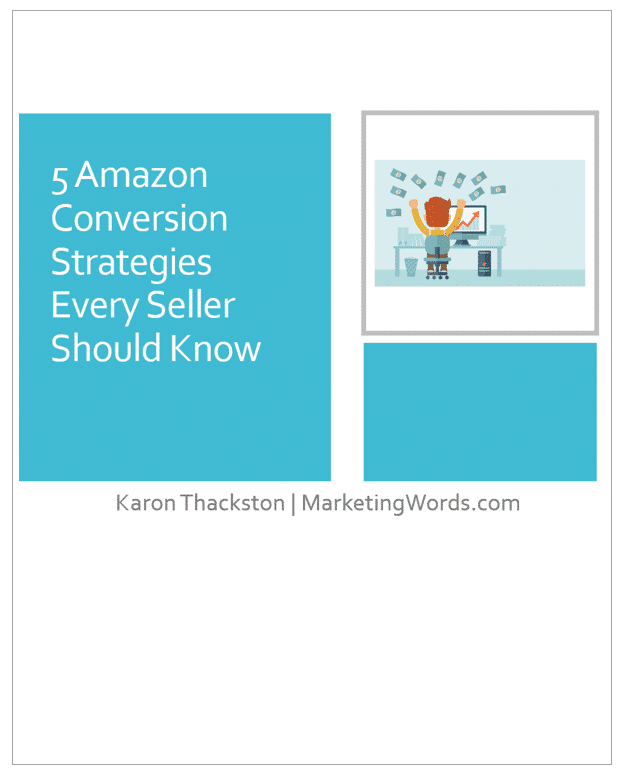 Most Amazon product research tools only provide data about products that are already selling. 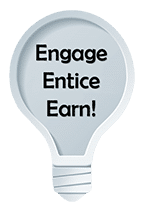 And while that is positively a huge help to millions of sellers, there’s another way to dig deeper and actually get ahead of new trends before your competition does. I ran into Julius Haralampou (co-founder of the product research tool Trendosaur) on LinkedIn. As our email conversation unfolded, he asked if I’d ever heard of his tool. I hadn’t. When he said it was geared toward finding wholesale products to sell on Amazon, Walmart, Etsy, eBay, Shopify, or any other site, I kind of wondered if this was going to be the same ole, same ole. So, I decided to take Trendosaur for a test drive for myself and see what it was all about. But I also wanted more information. My natural curiosity turned into more of an interview than an email. All the better for you to understand what Trendosaur is about. Here are the questions I asked of Julius, along with his detailed answers. I’ll show you screenshots of my experience using Trendosaur later in this post. KARON: What’s the story behind Trendosaur? What brought you to the point of creating Trendosaur? JULIUS: It was born out of necessity. In 2014, my business partner and I started an online retail company called Aven Republic. Our hurdle was choosing the best things to sell online. Picking the right items led to high revenue, high profit, and a boost to our company’s reputation. Picking the wrong products led to large amounts of unwanted inventory, a drastic hit to our cash flow, and ongoing storage fees. In order to keep up with the top-selling trends, we dedicated 6 manhours a week looking for new items. We scanned over 30 competitors’ websites, dozens of emails from perspective suppliers, combed through Alibaba.com, Groupon, Tech News Pages, Pinterest, eBay, product blogs, ecommerce forums and a myriad of other websites and marketplaces. We then built criteria to determine what constituted the best products to sell on Amazon, eBay, Walmart, and other marketplaces. More and more retail websites show how many of each item has sold, how many reviews it’s received and/or how many likes/loves each product has. We took note of what products were generating the most consumer interest each week and made note of the ones which were objectively trending above average. These are the items that we would import and sell. We also started noting global trend shifts. For example, if something sold well in Sweden, it would very likely sell well in Australia 2 weeks later. If something sold well in Japan, it would almost certainly sell well in the USA. We had a map of the globe with lines and figures drawn all over it. We then documented our product trend discovery method and outsourced the process to virtual assistants. They would follow these steps every week and send us a report of the popular items that sold very well that we should be looking at each week. We then automated this process using data extraction and analysis. Discovering, importing, and selling these products has led to higher revenues, and to our reputation as a business growing among our clients. We started doing business with Groupon UK, Groupon USA, Catch of the Day, and various other retail websites around the world who all wanted a slice of the revenue from our top-selling items. This system of picking best-selling items propelled our business to $2.6 million in sales revenue in 3 years. Realizing how much this technology would benefit other retailers, we optimized the interface, further developed the functionality, and branded it Trendosaur. How does Trendosaur compare to other ecommerce, eBay, or Amazon product research tools? JULIUS: While many others are fantastic platforms, and they really do help a lot of people find profitable products to sell, there is one problem. The trouble is they only find items that are already selling on Amazon or eBay or wherever, and you also have to learn how to use the software. They don’t use big data analytics to determine what is going to sell, they just show you what is currently selling in your region. KARON: Where does your data come from? Is it reliable? JULIUS: Trendosaur scans Amazon, eBay, Alibaba, AliExpress, Etsy, Wish.com, Groupon, Pinterest, Walmart, Tesco, Kogan, Kickstarter, Rakuten, Oberlo, JD.com, and hundreds of other retailers and retail platforms throughout the world. And from all that data scanning we can predict exactly what products are best to sell in a particular region. Websites change the way they present their data all the time, which is why we have a data scanning team that keeps on top of all of our data sources to make sure our data collection methods are the most accurate. Our algorithms are also constantly being reviewed and optimized internally as we learn more and more about the online retail world. Our reports now simply tell users exactly what products to sell in their regions; it takes the decision away from them and gives them definitive instructions. KARON: Why do we need to be concerned with regional sales if selling on Amazon, eBay, or other marketplace sites? JULIUS: Region simply refers to country; the reason we don’t use the word country is that there are certain places like Belgium, Netherlands, and Luxembourg that are different countries but all part of the same region. KARON: How long does it take to do a product search? JULIUS: Once you select the product category, region, and store type — Trendosaur calculates exactly what items you should be selling in the space of 17 seconds. KARON: Why is Trendosaur especially great for small retailers? JULIUS: Small retailers don’t have the time, people, or resources to manually sift through hundreds of thousands of online sales every single day to determine what wholesale products to sell on Amazon, eBay, Etsy, Walmart, or other sites. Small retailers spend on average 8 hours a week either passively or actively looking for new product to sell. Trendosaur subscribers get the top-selling items list emailed to them every 2 weeks. Time savings and a massive database of popular items are the biggest benefits to small retailers. KARON: What do I get when I run a report? Please talk about product suggestions, list of suppliers, pricing suggestions, etc. The report is downloadable immediately and is also sent to you via email. KARON: “Feeding the beast” is always a problem for smaller sellers. 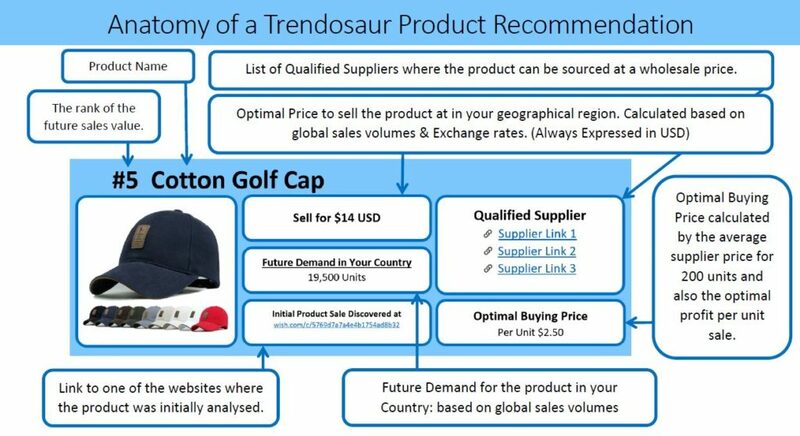 How does Trendosaur eliminate the headache of constantly needing to find new products? JULIUS: The problem of “feeding the beast” is exactly what Trendosaur was developed to solve. As a previous online store owner, I would go to bed most nights scrolling through retail stores on my phone. I would walk through shopping centers, I would flip through catalogues, I would subscribe to every retailer’s email list and I would spend hours on Alibaba, Wish.com, Groupon … every possible retail source on the planet. I just HAD to find and sell the next big trend. Too often I would hear about our competition making $150K from selling some new items that I hadn’t heard of yet. The fact of the matter is, that’s exactly how online store owners pay their rent and buy nice things … by selling products everyone wanted, but no one else was listing yet. KARON: Who is Trendosaur best for? Amazon sellers? People with Shopify stores or their own ecomm sites? eBay, Etsy, etc.? JULIUS: Trendosaur benefits any current or budding online retailers who are constantly asking the question What Product Will Make Me Money Today? While most of our Trendosaur subscribers have Shopify, Amazon, and eBay stores, we have subscribers who have custom-built stores, Magento stores, Big Commerce, WordPress, and even some buyers at national online retailers. Interesting Fact: Of the 32 million online stores in existence, there are only 650,000 that generate more than $1,000 each year. I bought a report to give it a try. It took about 2 minutes to fill out my information. Simple details like the category / categories I sold in, the country I was selling in, my budget for the items, how many products I would buy at a time, etc. Nothing out of ordinary. One-off reports with 20 items for $9. Monthly plans where you get reports of the new, best things to sell online every 2 weeks (20 items per report) for $9. This one makes the most sense to me if you’re selling online all the time. Discounted plans when you pay for 6 months at a time. At $9, it’s a no-brainer! No coupon is needed. I downloaded it within 20 seconds. It was neatly designed in a PDF file and was easy to read. …T rendosaur is worth a try. Have questions about what to sell on Amazon? Talk to me below! Have questions about What to sell on Amazon? Talk to me below.